-Material: the base of the furnace is one of the high light aluminum alloy, with light weight and high strength;the fire plate and the bracket are stainless steel, high temperature resistance and high strength. -Idear for camping, hiking and outdoor training, etc. With piezo ignition system, it's convenient to get fire started. Made of aluminum alloy and stainless steel, can withstand high temperature and weight, strong and sturdy in structure. Carry with a plastic box, portable and compact. 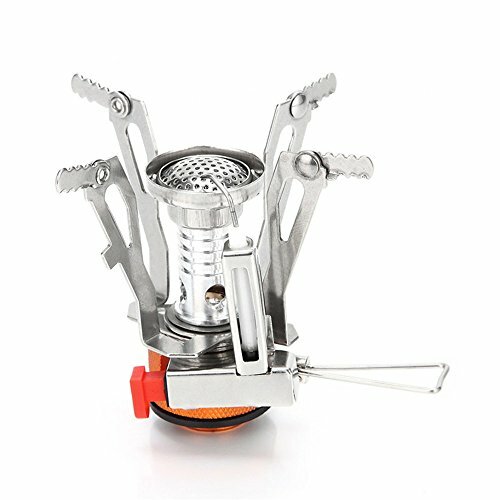 The mini camping stove is a safe companion to have stowed away in any emergency kit.Perfect for camping, hiking and outdoor training, etc.